In probability and statistics, the Gompertz distribution is a continuous probability distribution, named after Benjamin Gompertz (1779 - 1865). The Gompertz distribution is often applied to describe the distribution of adult lifespans by demographers and actuaries. Related fields of science such as biology and gerontology also considered the Gompertz distribution for the analysis of survival. More recently, computer scientists have also started to model the failure rates of computer codes by the Gompertz distribution. In Marketing Science, it has been used as an individual-level simulation for customer lifetime value modeling. In network theory, particularly the Erdős–Rényi model, the walk length of a random self-avoiding walk (SAW) is distributed according to the Gompertz distribution. where is the scale parameter and is the shape parameter of the Gompertz distribution. In the actuarial and biological sciences and in demography, the Gompertz distribution is parametrized slightly differently (Gompertz–Makeham law of mortality). The Gompertz distribution is a flexible distribution that can be skewed to the right and to the left. Its hazard function is a convex function of . The model can be fitted into the innovation-imitation paradigm with as the coefficient of innovation and as the coefficient of imitation. When becomes large, approaches . The model can also belong to the propensity-to-adopt paradigm with as the propensity to adopt and as the overall appeal of the new offering. When the probability density function has its mode at 0.
where denotes the exponential integral and is the upper incomplete gamma function. 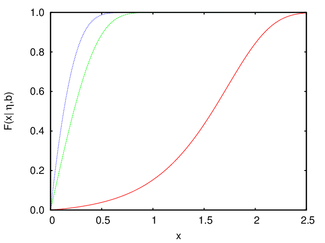 If X is defined to be the result of sampling from a Gumbel distribution until a negative value Y is produced, and setting X=−Y, then X has a Gompertz distribution. When varies according to a gamma distribution with shape parameter and scale parameter (mean = ), the distribution of is Gamma/Gompertz. ↑ Vaupel, James W. (1986). "How change in age-specific mortality affects life expectancy". Population Studies. 40 (1): 147–157. doi:10.1080/0032472031000141896. ↑ Preston, Samuel H.; Heuveline, Patrick; Guillot, Michel (2001). Demography:measuring and modeling population processes. Oxford: Blackwell. ↑ Benjamin, Bernard; Haycocks, H.W. ; Pollard, J. (1980). The Analysis of Mortality and Other Actuarial Statistics. London: Heinemann. ↑ Willemse, W. J.; Koppelaar, H. (2000). "Knowledge elicitation of Gompertz' law of mortality". Scandinavian Actuarial Journal (2): 168–179. ↑ Economos, A. (1982). "Rate of aging, rate of dying and the mechanism of mortality". Archives of Gerontology and Geriatrics. 1 (1): 46–51. ↑ Brown, K.; Forbes, W. (1974). "A mathematical model of aging processes". Journal of Gerontology. 29 (1): 46–51. doi:10.1093/geronj/29.1.46. ↑ Ohishi, K.; Okamura, H.; Dohi, T. (2009). "Gompertz software reliability model: estimation algorithm and empirical validation". Journal of Systems and Software. 82 (3): 535–543. doi:10.1016/j.jss.2008.11.840. 1 2 3 Bemmaor, Albert C.; Glady, Nicolas (2012). "Modeling Purchasing Behavior With Sudden 'Death': A Flexible Customer Lifetime Model". Management Science. 58 (5): 1012–1021. doi:10.1287/mnsc.1110.1461. ↑ Tishby, Biham, Katzav (2016), The distribution of path lengths of self avoiding walks on Erdős-Rényi networks, arXiv:1603.06613. ↑ Bauckhage, C. (2014), Characterizations and Kullback-Leibler Divergence of Gompertz Distributions, arXiv:1402.3193. Sheikh, A. K.; Boah, J. K.; Younas, M. (1989). "Truncated Extreme Value Model for Pipeline Reliability". Reliability Engineering and System Safety. 25 (1): 1–14. doi:10.1016/0951-8320(89)90020-3.